This is a first for me. It’s the first time I’ve cooked a curry that doesn’t have any chilli in it at all. Not one single bit. None. Instead, this is a simple dish that relies on the delicate depth of its spicing for character and body. This is an excellent dish for those times when you’re trying to introduce people who don’t normally eat spicy food to something a little more adventurous … our kids in particular loved this dish, because it’s rich and tasty, but lacks that stringent kick that comes with a lot of heavily chilli-laden Asian food. 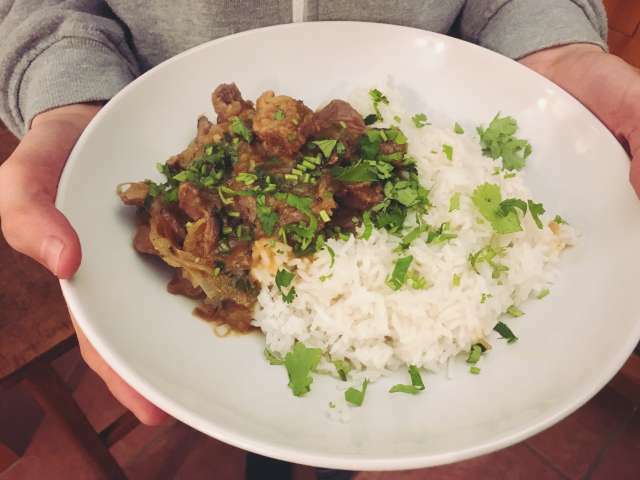 This is a Maharastrian Hindu recipe from vast Western central province of India, and it traditionally uses mutton or goat, but lamb is a suitable substitute if you can;t get hold of either. Goat, in particular, is very good prepared in this way. To start, fry four cloves and a green cardamom pod in a good slug of vegetable oil until they become fragrant and start to sizzle, then add 500g of ripe tomatoes, quartered, to the pan, and reduce the heat. Cover the pan and cook the tomatoes for about half an hour, nudging them around every now and again to help them break down. When the tomatoes have all but disintegrated, pass them through a sieve, pushing the pulp through with the back of a spoon. It takes perseverance and time to do this, but try to wring every last drop of tomato sauce out of the pulp. In another large pan, preferable a sauté or frying pan of some sort, heat another slug of vegetable oil and add two bay leaves, four cloves, and four cardamom pods, and fry for a minute before adding 500g of sliced red onions. Cook for a few more minutes until the onions start to soften, and then add eight cloves of garlic, minced, and two teaspoons of minced ginger. Continue to cook over a low heat with the pan covered for about ten minutes, then add 500g of cubed mutton, goat or lamb. If some is on the bone, all the better. Stir the meat around to combine, and cover again for another ten minutes, then pour in the tomato gravy and a couple of teaspoons of salt and let the dish cook slowly, covered, for at least forty minutes. Depending on the type of meat you use, it may take longer. To finish, taste and adjust the seasoning, and sprinkle over a good handful of chopped coriander leaves.